Fencing Solutions are now providing a Post Hole Borer Hire service throughout the Droitwich & Wychavon Area. Clients and customers looking to book our Borer with operator can do so hourly or daily and at very competitive rates. See the Fencing Solutions borer in action in the video below. 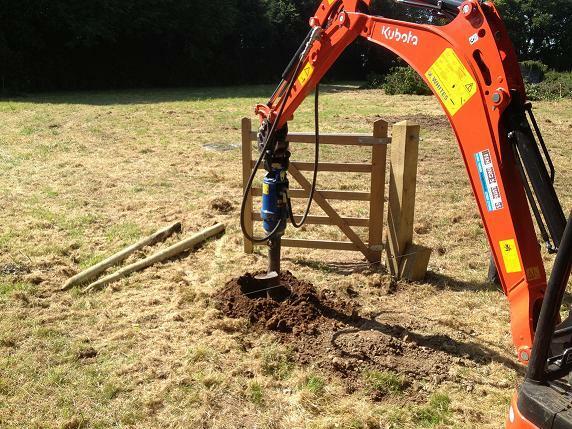 As well as having it’s uses for tree planting, the Post Hole Borer / Auger works as an extremely efficient means of excavating tough terrain for fence post installations. Our Post hole borer is particularly useful when it comes to fencing solutions required across undulating terrain with many slopes or gradients. As a precise and cost effective means of facilitating a fencing installation, the post hole borer, is particularly suited to larger of more difficult fencing requirements, whereas when fitted with our Post Rammer attachment, it will make short work of traditional farm or perimeter fencing by simply aligning the posts without excavation and “Ramming” home. All of our Post Borer / Rammer Technicians are experienced fencing contractors and will be only too pleased to offer you advice on which solution might best suit your particular requirements. Hiring out our Post Hole Borer couldn’t be easier. Just fill in the quick enquiry form (left), or if you’d prefer, simply call us call us on: 01905 748856 or 07808 273405, when we’ll be happy to discuss your requirements and our rates.